“People don’t dislike ink; they dislike having to change expensive ink cartridges frequently and without warning,” said Paul Saussey, General Manager of Sales for Brother Australia. Launching on the 22nd of October exclusively through Officeworks, the Brother DLP-J1100DW and MFC-J1300DW are both continuous ink printers that promise to come bundled with 1 year's worth of ink (based on a usage rate of 150-pages per month). Like other continuous ink printers, the pitch here is that you pay more up-front but get a lot more value out of the product over the long term. Rather than swap ink cartridges every so often to refill these printers, you'll have to buy INKvestment Tanks from Brother themselves. A refill of the black ink tank will cost $41 and account for 3000 pages worth of ink. Each color refill carries the same price-tag but will only be good for half as many pages. The major difference between the two models comes down to connectivity and fax support. The DLP-J1100DW lacks the latter and only comes with basic wireless connectivity compared to the MFC-J1300DW's NFC and Ethernet functionality. Brother are also emphasizing several ease-of-use features usually found in their more expensive enterprise printers here. Chief among them is the new Brother Intelligent Page Gauge. This exclusive feature, which Brother claim is the first-of-its-kind, monitors actual ink usage and displays estimated remaining page counts on the printer's 6.8cm color touchscreen. Both new printers also come ready to integrate with the new desktop version of the company's iPrint&Scan app. This application allows you to remotely monitor and use the printer and, new to the desktop of the app, set up workflows. These are routines of commands that you can string together specific commands to suit your individual workflow. 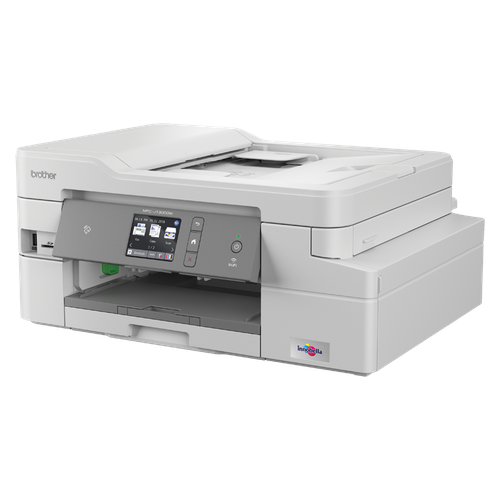 The Brother DLP-J1100DW is priced at $289 while the MFC-J1300DW is priced at $389. Both will be available exclusively through Officeworks from the 22nd of October.